The Brute Knuckles (鉄人のコブシ?, lit. : "Iron Man's Fist") is one of the treasures found in Pikmin 2. 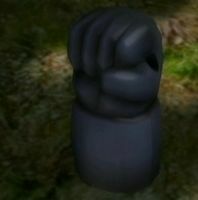 It is a toy punching glove that is found inside one of the four Mamutas in the fifth sublevel of the Frontier Cavern. Before collecting it, defeat all the Mamutas in the area so they won't harm the leaders or plant the Pikmin as the treasure is being carried back to the Pod. Make sure the Caustic Dweevils are gone so they won't carry the treasure on their backs. After the Research Pod cashes in the Brute Knuckles, the leaders receive the Rocket Fist ability. “Processing... How strange. This atypical metal object came from inside that bizarre being. ...It appears to be a giant metal hand. Perhaps it is an ancient work of art? ...And here is that very glove! I have just found the missing Rocket Punch[sic] in my junk hold! ...And here is that very glove! I have just found the missing Rocket Fist in my junk hold! Olimar using the Rocket Fist. A different angle of Olimar using the Rocket Fist. The Brute Knuckles as seen from behind. The Brute Knuckles being analyzed by the Hocotate ship. This is the only treasure which gives the player an utility-like Exploration Kit upgrade that has not been eaten by a boss. This article was a featured article from March 16th to May 23rd, 2012. This page was last edited on December 29, 2018, at 14:52.